Throughout 45 years, Toyota Indonesia has successfully marketed 5 million unit of cars, in domestic market. Along with it, in September, 1 million units which manufactured originally in Indonesia, have been successfully exported to foreign countries in completely built-up/CBU. Jakarta- To mark its 45 years existence in national automotive sector, Toyota Indonesia, today (29/10) conducting various event which attended by Vice President of Republic of Indonesia Mr.Jusuf Kalla, Minister of Industry Airlangga Hartanto, Minister of Labor Hanif Dhakiri, Managing Officer Toyota Motor Corporation (TMC) - CEO for Asia, Middle East, & North Africa and also President Director TAM Hiroyuki Fukui, President Director TMMIN Masahiro Nonami, Vice President Director TMMIN Warih Andang Tjahjono, Vice President Director TAM Henry Tanoto, along with board of director and management of TAM and TMMIN. As gratitudefor supports from many parties for 45 years journey of Toyota in Indonesia, today Toyota also held Toyota Classic Concert which also purposed for raising funds of Rp1,5 billion, and will be donated to build Eco Gallery in 10 schools of Toyota Eco Youth Program’s participants. “We are very pleased and grateful for all supports from every parties, so Toyota stil can act in Indonesia for 45 years. This achievement, off course, supported by continuous trust from Indonesia people, to the product, technology and Toyota’s service, government’s role in creating condusive business climate in automotive sector, and also support from our partners, suppliers and dealers in Indonesia,” said Managing Officer TMC, CEO for Asia, Middle East & North Africa and President Director TAM Hiroyuki Fukui. Toyota Indonesia has exported completely built up (CBU) since 1987. The first exported product is 3rd generation of Kijang (Kijang super), which exported to Brunei Darussalam. At that time, export volume per year was about 500 units with 5 destination countries around ASEAN and Pacific region. Export commitment of Toyota Indonesia continued to grow, and achieved great momentum since expansion of 5th generation of Toyota Kijang, or known as Kijang Innova, in 2004. Export performance of Toyota Indonesia continued to increase in the following years along with beginning of Fortuner, Vios and Yaris’ manufacturing in Indonesia. Currently, Toyota’s CBU average export volume from Toyota manufacturing and group in Indonesia has reached 12,000 units/month. Last year, Toyota’s CBU export from Indonesia, contributed amount of 176,700 units, which is almost 85% of Indonesia’s CBU export total. The present milestone of Toyota Indonesia’s export achieved on September 2016, with export volume accumulation that break through 1 million units, or 1,001,726 for precisely. Toyota Indonesia also exports Complete Knock Down/CKD, 2 gasoline engine and ethanol types, component, and manufacturing tools in Dies and Jig procession. These Toyota Indonesia’s export products shipped to more than 80 countries in Asia-Pacific, Middle-East, South America, Carribian Island, and Africa region. “Achievement of 1 million units model export from Toyota has become a great proof that Indonesia’s automotive product is capable to compete in global market. Toyota Indonesia’s position has been more strategic so it could give more chances to contribute in national automotive industry, and at once become one of manufacturing base and Toyota’s cars global export for supplying international market to more than 80 countries in the world,” said President Director TMMIN Masahiro Nonami. To be able to compete, either in domestic market or export, Toyota Indonesia is expected to have and always increasing global quality of its products. Therefore, TMMIN implements good partnership with local suppliers, so both of them could grow together and increase quality to fulfill customer needs. One of special function in TMMIN is dedicated for cooperating with supplier, from skills transfer, safety standard, quality, efficiency, until logistic. TMMIN also engages the first suppliers to transfer this knowledge to their suppliers, so the domino’s effect will be achieved. Currently, TMMIN products contain of local component, average in 60%-85%, which supported by 139 local suppliers in first line. This is a greatly increasing from the first introduction of Kijang model in 1977, which contained of local component about 19% from 8 local suppliers. “We, together with supply chain, will always try to continue the best effort for increasing Toyota’s products competitiveness. So we could always fulfill customer needs. There is no doubt, Toyota will continuously increase business operation in Indonesia, to contribute for national automotive industry’s growth, and giving contribution to people. At the end, our existence could be a proud asset for the nation,” said President Director TMMIN Warih Andang Tjahjono. For more than 4 decades, Toyota always works hard seriously in exploring market potency and automotive industry in Indonesia. There are various efforts done by Toyota, to fulfill challenge of various vehicles from people needs. So, Toyota always investing in Indonesia, during 2012-2014 in the amount of 13 trillion Rupiah. One of the investation is operating Plant Karawang 2, which Etios, Valco, Vios,and Yaris’ model has been localized in manufacturing. Throughout the year of 2015 and 2016, Toyota Indonesia has done the new investation, in the amount of 10.4 trillion Rupiah. This investation is intended for manufacturing the new model of Kijang Innova and Fortuner, operating Plant Karawang 3 which produce gasoline and ethanol’s aluminium machine type R-NR, and also starting Sienta model manufacturing. Plant Karawang 3 is the first machinery Toyota plant in the world, which applied “Through Line” concept. This concept requires “all manufacturing processes in one plant”. Meanwhile, Indonesia has become the first country outside Japan, which manufactured and exported The All New Sienta. This investation not included capital which invested by supply chain of Toyota Indonesia from upstream to downstream, such as local suppliers and dealers that spread all over Indonesia, and other Toyota’s company groups in Indonesia. Along with increasing of people’s purchasing power, at least in this last 10 years, demand or needs of vehicles also increase. This could give chances for Toyota to fulfill them with products and best services. It can be seen from Toyota sale which able to reach growth above average, so the market share also increase significantly. In this last one decade, market share of Toyota cars is up to 33%, compared with previous period of 24%-25%, with sale about 50,000 per year. Even in 2006, this market share reached the highest position, which is 38%, with volume of 280,000 units per year. This achievement, off course, is a proof of seriously reflection of Toyota in exploring market potential, and become the primary choice from most of Indonesia people. In fulfilling the dynamic of customer needs’ growth, Toyota not only focused on product improvement, but also focused on service, including the best aftersales. So Toyota could get positive respond from customer. Toyota always confident that building customer’s trust must be done in every aspects, which is by product and best service. Increasing of sales amount with the biggest market share has put Toyota as a brand which become primary locomotive of automotive market dynamic, until now. Toyota Indonesia also care of sales network’s development and aftersales, to meet the needs of Indonesia customers. Until October 2016, Toyota’s recorded 292 official outlets, which ready to serve every customer’s needs. Support from dealers also become one of the important factor, to gain trust from Indonesia people, so Toyota could be one of the automotive market leader in Indonesia. Achievement during 45 years also put Toyota’s car as the biggest population in Indonesia, with number of 4.9 million units, which attended and selected by customer in Indonesia. Today, Toyota provides more than 22 models and also add with 8 Lexus models, to fulfill automotive consumer’s needs in Indonesia. The success of Toyota’s marketing in national market, has been put Indonesia as strategic part. Because Indonesia reached 4th place of biggest market position in Toyota Global’s range, after Japan, USA and China. Toyota optimistic, with 45 years experience which really learning carefully from Indonesia people needs, consumer trust which has been built all this time could be maintained continuously, even increasing. Various product development research and services, continuously done, so Toyota cars always match with demographic and geographic condition, and also with growth of Indonesia people needs, such as Toyota Kijang and Avanza which become phenomenal MPV in Indonesia. Likewise, development of another cars, so that almost 90% Toyota cars sold in Indonesia already used manufacturing facilities in Indonesia. Especially in this year, ending Q3 of 2016, Toyota has bookmarked proudly performance with total retail sale 280,179 units or increase 18.7% compared with the same period in 2015. This number is much better than national growth which recorded at 2.4%. In this period, Toyota also bookmark market share at 36%. This achievement supported by performance growth in SUV and MPV segment, due to presence of new products such as All New Fortuner, All New Innova, All New Sienta, and All New Calya, along with stabilized of Toyota Avanza and Veloz’s sale. “My gratitude to all customer’s trust which become stronger, that reflected by sale growth. This is in line with Let’s Go beyond spirit, which become our standard and has a meaning of doing improvement continuously through Beyond Product, Beyond Technology, and Beyond Service concept, so our product and service are beyond customer expectation,” said Vice President Director TAM Henry Tanoto. The spirit of Let’s Go Beyond is commitment of Toyota to give something beyond customer expectation. This is an answer of bigger challenges, among market competitiveness which getting tougher everyday, and also customer needs which more various than before. In this new spirit, Toyota has launched new products in the last two years, such as Grand New Avanza and Grand New Veloz, Alphard Hybrid, All New Innova, All New Fortuner, New Rush, All New Sienta, and All New Calya. All these products get positive respond from Indonesia people. Celebration of 45 Years Toyota in Indonesia is closed by classic music’s charity concert Toyota Classic Concert, enlivened by the Baltic Neopolis Orchestra from Poland. This orchestra is directed by Artistic Director and famous violinist, Vasko Vassilev, and music arrangement by pianist and composer from Singapore, Pamela Tan Nicholson. Toyota Classic Concert also enlivened by Indonesian musician, Isyana Sarasvati, who sings accompanied by luxurious orchestra. All ticket sales from Toyota Classic Concert of 1.5 billion will be donated to 10 schools of Toyota Eco Youth program’s participant. This donation is part of Corporate Social Responsibility’s activities by Toyota Indonesia, which consisting of education program, environment program, traffic safety program, enhancement of community’s life dignity, and philantrophy. Some of Toyota Indonesia CSR activities are through Yayasan Toyota & Astra (YTA), which distributed scholarship to 96,000 students of Elementary School, Junior High School, Senior High School and College, since 1974 until 2015. Toyota Indonesia also donated hundreds of practical tools such as cars, machines and components to educational institution and Vocational Training Centers. Toyota Indonesia CSR also cares to environmental sustainability. One of them is tree plantation activity, with “Toyota Forest” and “Car for Tree” theme, which has been planted more than 800,000 trees. Furthermore, Toyota Eco Youth program has been started since 2005 until present, with more than 750 schools in 26 province in Indonesia are involved through 2,500 environmental improvement’s proposals. “It’s been our commitment and responsibility to participate in various social activities as part of Indonesia nation. 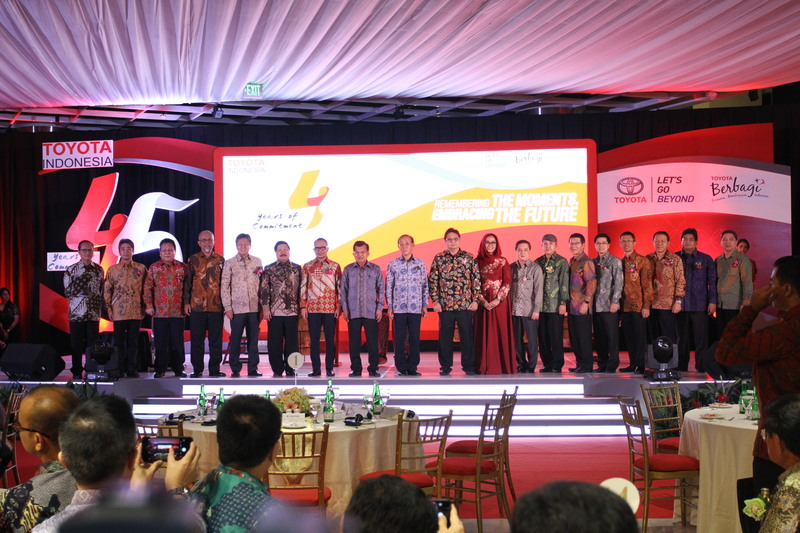 Truly, the presence of Toyota Indonesia is expected to give meaning for surrounding environment and the nation, wherever we are,” said Vice President Director TAM Henry Tanoto.